What would make a woman who seemingly has everything decide to leave her established life and start over from scratch? 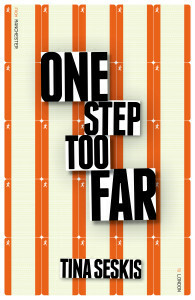 That is the subject of One Step Too Far, the debut novel by Tina Seskis. The book opens with Emily Coleman sneaking out of the house that she shares with her husband, Ben. With great sadness, Emily goes on the run and decides to start a new life on her own in London, taking nothing with her accept a bit of money, not even her name. As the book progresses, Ms. Seskis lays out for us a combination of the past and present that paints the picture of the events that shape Emily's life and ultimately influence her to make the decision to leave it all behind and become someone else. In order to tell Emily's story, the author chose to use multiple viewpoints. The story is alternately told through chapters devoted to the present and flashbacks of the past. In addition, we get to see the story from the viewpoint of the people who are the closest to Emily, her mother, father, twin sister Caroline, husband, and even her new best friend, Angel. Some readers I have talked to found the large number of different viewpoints confusing, but it definitely worked for me. I found that the use of both different time periods and multiple characters to tell the story made the story richer and more complete. For me, I especially like when authors tell a story from the viewpoint of several characters. When it is done correctly, as is the case with this book, it allows me to become more involved with each one, increasing the amount that I am invested in the story overall. Early on in the book you become aware that a personal tragedy was the catalyst for Emily's decision to run away. I felt that the author did a brilliant job with this part of the story. Although the tragedy was alluded to many times in the book, and by several of the characters, never once was enough information given to reveal the ending twist to this book. There were definitely clues, and definitely times when I thought I had figured out what exactly the catalyst was, but when the actual event was revealed, I was stunned. After first being confused and taking a moment to think about what I was reading, I began wondering what I had missed. After a short time, though, I found myself saying, "Well done, Ms. Seskis, well done." I admit, I get particularly excited when an author is able to put a twist into a book that I could not see coming at all. In the end, I definitely understood why Emily would want to start over. There were two minor things that kept this from being a 5 star book. First, there were several flashbacks to the younger years of Emily's friend Angel. By the end of the book it did not seem that these chapters necessary and I felt myself wondering how they tied in. Additionally, I would have liked the ultimate ending to have played out a bit differently, but that is just me. I would have to say, though, that this book was a solid read from start to finish. I found myself looking forward to reading it and being a bit upset if something interrupted me and I had to put it down. It both made me think about the characters, and feel for them, and the twist at the end really caught me by surprise. I just found out that Ms. Seskis has another book being released soon, and I am also looking forward to reading that one.